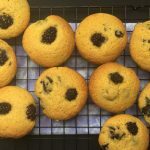 Let me say right off the bat that these Blackberry Corn Muffins are not your run of the mill corn muffins. I mean let’s be honest, a lot of corn muffins can be kind of bland. I mean they’re good and I will not turn one down if offered, but they’re nothing special. That is not the case here. What makes these muffins different is the deep rustic corn flavor. They taste like a corn muffin is supposed to taste. That along with a sweet burst of fruit you get with each bite puts them on a whole different level. 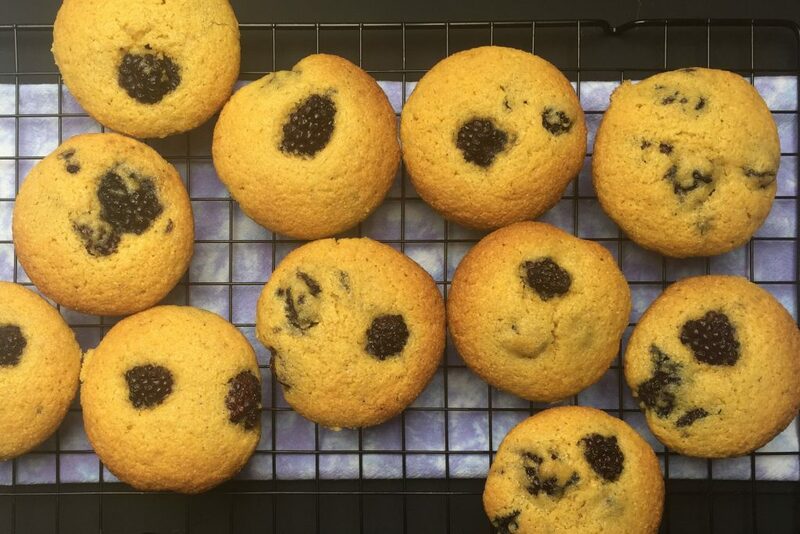 These Blackberry Corn Muffins rock. The corn muffins that I am used to, are the sort that I get at coffee shops here in New England. They are sweet but a little on the dry side, with the corn flavor more in the background. Tasty but they really need to be toasted with a smear of butter on them to stand out. That is exactly what a lot of breakfast diners around here do with their corn muffins. It’s not a bad thing. I’m not sure why but for some reason I had never made them myself. I tested several recipes but it wasn’t until I came across Sara Foster’s recipe that I understood how good corn muffins can actually be. What a difference! The taste of corn shines through. So flavorful and the addition of fresh blackberries just puts them over the top. The only real change I made to the recipe was adding more blackberries. You don’t need to but I like having one of those sweet juicy berries in every bite. Butter a 12 cup muffin tin and line with paper liners. Make sure you also butter/or oil the top area of the tin so that the muffins do not stick there when they rise. In a medium bowl, whisk together the flour, corn meal, sugar, baking powder, baking soda, and the salt. Set aside. In a large bowl, whisk together the eggs, buttermilk, canola oil and the vanilla. With a rubber spatula, fold in about 1/3 of the dry ingredients into the wet ingredients and gently mix. Continue in this manner with the remaining dry ingredients a third at a time until just mixed. You are looking to incorporate the flour but be sure to not over mix. It is fine if a few lumps are showing. Gently stir in 2 cups of the blackberries just to combine. Set aside the remaining 1/2 cup of berries. Spoon the muffin batter evenly into the 12 tins. I like to use a large ice cream scoop for this. 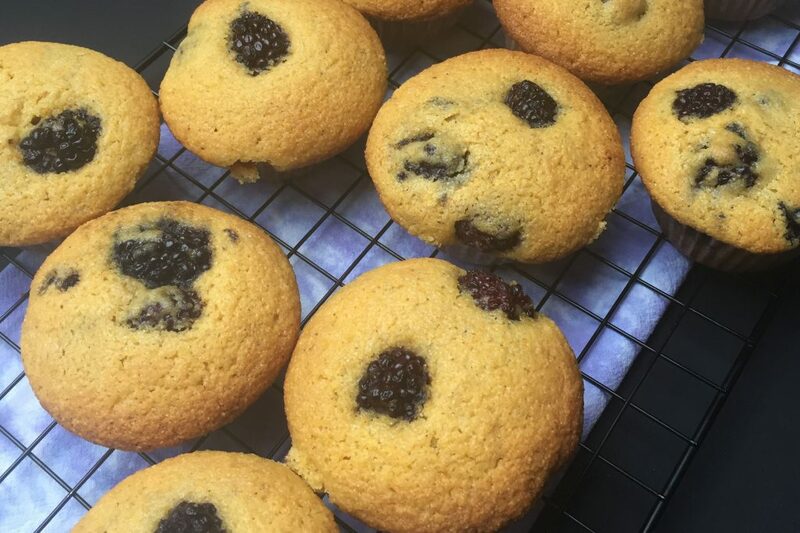 Using the remaining blackberries, place one or two on the top of each muffin. Optional but it looks nice when they are baked. 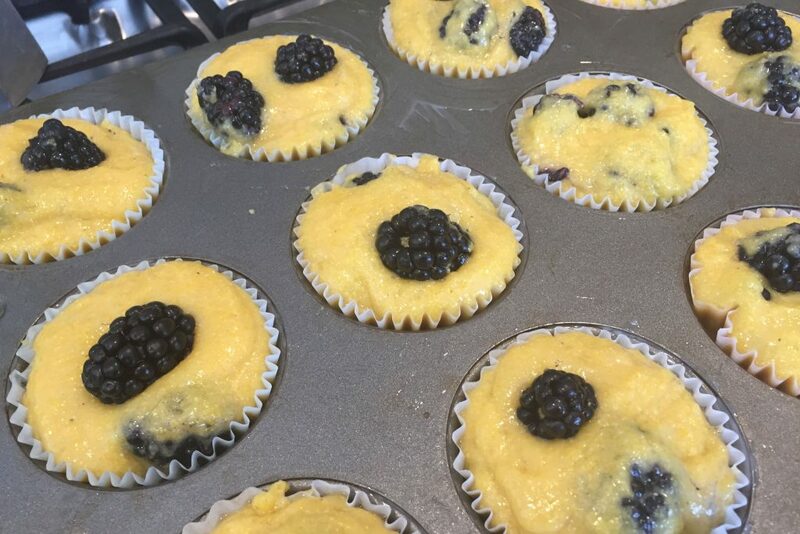 It really highlights that they are blackberry muffins. Bake muffins for 20 to 25 minutes. Use a toothpick to see if they are done. A few moist crumbs may cling but you should not see any wet batter. Do not over bake. Let the muffins cool in the pan for a few minutes and then transfer to a cooling rack. 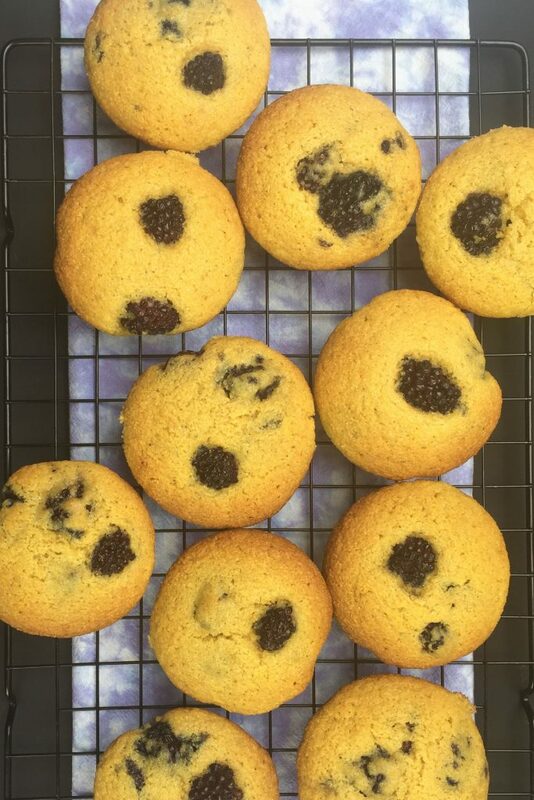 These Blackberry Corn Muffins taste best served warm and the same day that they are made. The original recipe calls for only 1-1/2 cups of blackberries. You could substitute blueberries or raspberries for the blackberries. *Adapted recipe from Sara Foster's cookbook "Fresh Everyday".